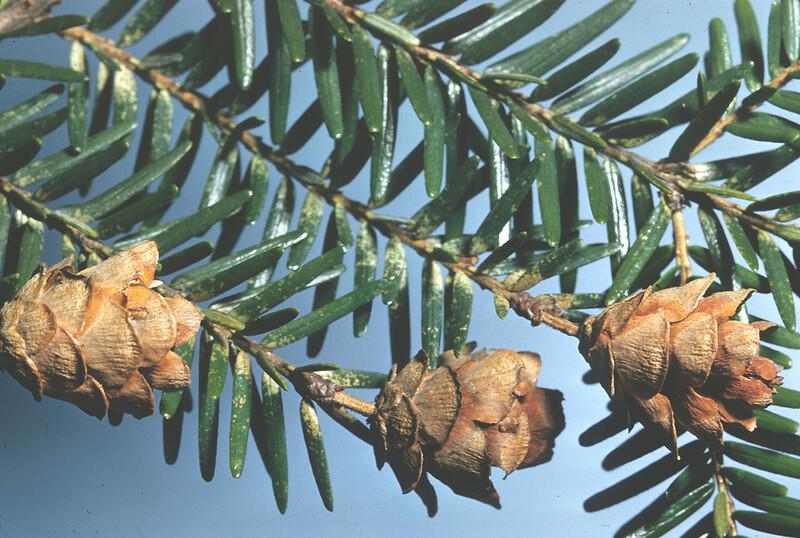 Tsuga-canadensis.Adelaide Pratt. Copyright © 2015 New England Wild Flower Society. gobotany.newenglandwild.org. (Accessed 1/2015). Tsuga canadensis is a tree to 30 m tall; gymnosperm; evergreen, shade tolerant, branches angled downward. Roots associated with ectomycorrhizal fungi (Berliner and Torrey 1989). Tsuga canadensis.wooly adelgid.en.wikipedia.org. (Accessed 5/2014). Leaves: Needles short to 1.5 cm, flat, in flat sprays. Flowers and Fruit none. Cones small, to 2 cm long, scales thin. Seeds eaten by birds and small mammals (Martin et al. 1951). 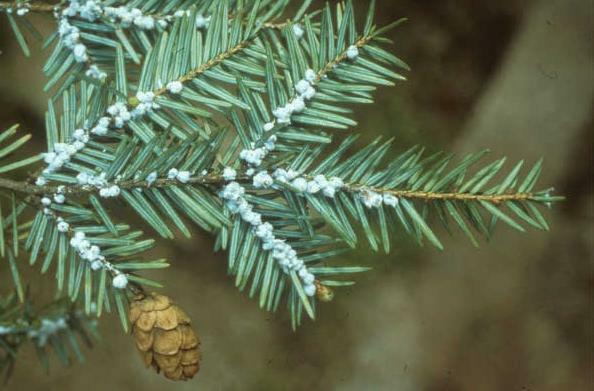 Tsuga canadensis tree.Creative Commons Attribution-ShareAlike 3.0 License.woodyplants.wdfiles.com (Accessed 3/2017). Habitat: In the City it is generally planted. Usually grows on north facing slopes in moist soil, especially in rocky stream ravines, soil pH 4.2-5.7 (USDA, NRCS 2010). Very shade tolerant, index 10. Intolerant of salt, soil compaction, flooding (but needs moist soil). Notes: Growth rate very slow, 1.79 (relative to 0.99 for sugar maple; 9.24 Betula populifolia). Slow growth rate found to correlate well with high shade tolerance (Grime 1965). Intolerant of fire, especially seedlings and saplings. Many trees killed by wooly adelgid (Adelges tsugae) a phloem-sucking aphid (Homoptera; family Eriosomatidae) (Borror and White 1970) that weakens trees, it can cause leaf drop which defoliates and kills trees. Adults and eggs hide under cottony masses of waxy filaments on twigs and needles. A Japanese ladybird beetle, Pseudoscymnus tsugae, (Coleoptera, family Coccinellidae) (White 1983), that attacks the wooly adelgid is being studied and introduced in some sites. It holds some promise of saving this tree (McClure and Cheah 1999; Cheah and McClure 1998; Sasaji and McClure 1997; McManus et al. 1999). 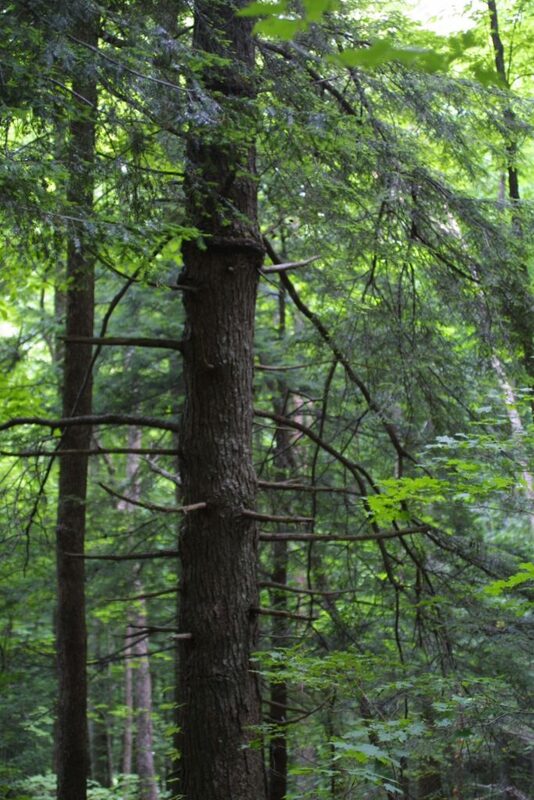 Another avenue for control may be fungi that attack the wooly adelgid (Reid et al 2010).